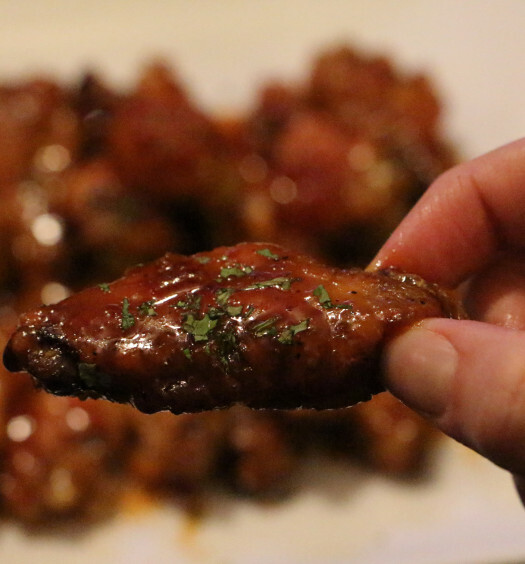 As I have mentioned in a previous post, Wings are my ultimate appetizer nowadays. When I was younger we used to take-out Wings and I hated them because they were coated in a thick breading and greasy. Yuck! So I bake mine without breading…wing-win. Truth be told, this wing sauce is phenomenal. It hits the right tastebuds with it’s sweet, sour, tang and slight kick. It’s all in the tamarind. Tamarind is equivalent to an indian date. It’s got a tough skin but the beautiful pulp inside is golden. I used my mum’s infamous Tamarind sauce called “Imlee Ki Chatni”. It’s a sweet and tangy condiment used to dip samosas, pakoras and well…anything under the sun in my books. I LOVE this sauce especially my mums. She makes it with a certain je ne sais quoi. 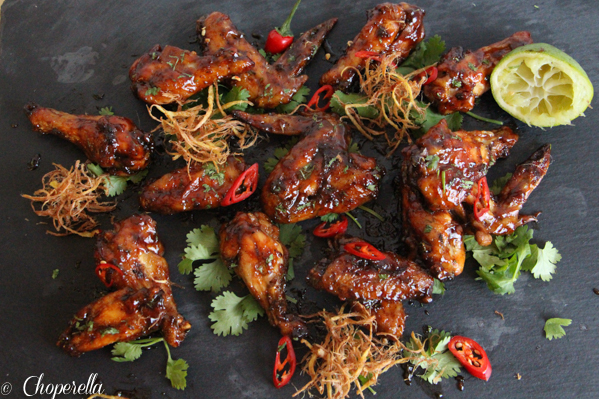 To start use the basic wing recipe to cook the wings. Some butter, oil, salt, pepper, garlic powder and a little cumin this time, pop em’ in an oven and they’ll crisp right up. In a sauce pan heat 1/2 cups of tamarind sauce. Take another 1/2 cup of tamarind sauce and a handful of fresh cilantro, blend it together and mix into the heating tamarind sauce. Add the juice of half a lime, some fresh sliced red chilli, cumin powder and a pinch of salt. Once the wings are nice and crispy, toss them in the sauce until they’re well coated. Plate them in a big pile and garnish with some fresh cilantro, lime wedges and some more chillies if you must. They’re deliciously sticky, messy and delicious! Enjoy! 1. Turn the oven on to 450ºF. Make sure the rack is on the top level. 2. Clean and dry the wings and line a baking sheet with foil. 4. Place the wings in one layer on the baking sheet. 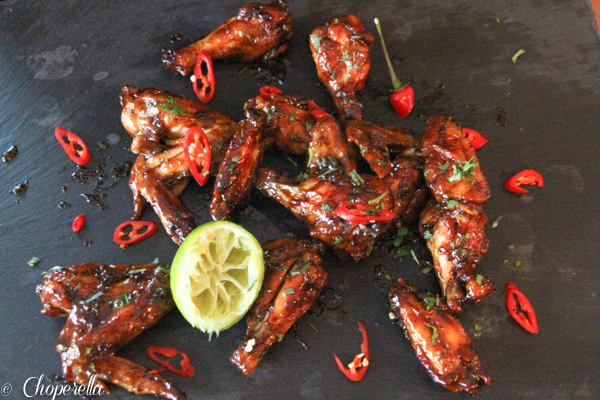 Once the oven is preheated, place the chicken wings in the oven for 45-50 minutes. Flip them halfway trough. 5. While the wings are cooking, prepare the sauce. Put the 1 1/2 cups Tamarind Sauce, Chili and spices in a saucepan. Whisk to combine and heat on medium low. Take the 1/2 cup of sauce and the handful of coriander and blend together. Then mix into the sauce. 6. Once the wings are done, they should be nice an browned and crispy, place them in the sauce and toss to coat them. Keep in the pan and toss for about a minute. This will aid the sauce to stick to the wings as you cook it down with them. 7. 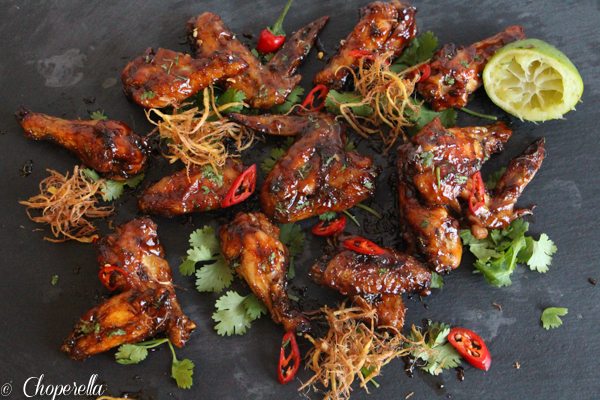 After they are completely coated, plate them and garnish with the lime wedges, fresh coriander and chillies. 8. ** Optional** Garnish with some fried ginger: Finely chop fresh ginger. Shallow fry for approximately 5 minutes until golden brown.